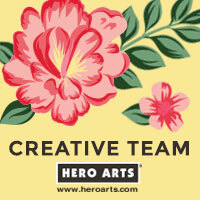 I'm so excited to be hosting the Hero Arts Blog this week. All of the cards I'll be sharing this week use punches in some fun ways. There is also a new contest theme up for May....check it out here. Since I'm focusing on punches this week, I thought I'd share a few of my favorites with you. I just LOVE EK Success punches. They have great designs and seem to punch though thicker paper than other punches I have. This list could go on and on, but those are some of my favorites right now. And since it just doesn't feel right to post without sharing a card...here is one that I created a while back. The sentiment is from this must have set from Hero Arts. And the border punch used is another one of my favs (it's this one...and is a great price too). I'll be back on Wednesday with a new challenge at Caardvarks. love the mix of colors and papers! good to see you hosting the blog! Beautiful mix of colors on this card, love it Kelly! Love this card and enjoying you on the Hero blog!! wow, I am impressed at all you did in a day! sand, bikes, library... the sheer number of times I have to buckle 3 kids in and out of carseats is enough to exhaust me! haha! :) Love having you on the blog this week! You are so talented. Blessings to you and your family!